Finally SimParts can introduce a high technology up-to-date Lithium Ion battery for your todays buggy, ATV, UTV, motorcycle or other Power Sports application. Lithium polymer batteries comply with the rapid development of modern portable device industry. It was developed as a new type of high-energy secondary (rechargeable) battery at the end of the twentieth century. It has characteristic of light weight, high power and long service life. So this is a high level portable power supply product. Now this new lithium-ion technology is transferred for the use in Power Sport start batteries. The result is a SHIDO LION battery that is perfectly adapted to bring the maximum power and comfort for use in your buggy. 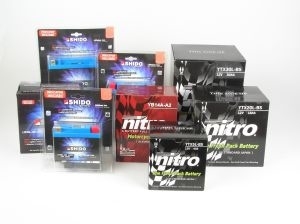 SHIDO LION batteries use Lithium Iron Phosphate (LiFeP04) as positive material and Graphite(C) as negative material. This brings the use of top-technology with all his advantages, the nearest as possible to the characteristic use of Power Sport start batteries. SHIDO LION Ion battery is formed by 4 Lithium Iron Phosphate battery cells connected in series, the battery voltage is 12.8 Volt. This leads to the highest advantages for the use of Power Sport applications as Start-Battery. If you still have any questions, please do not hesitate to contact us via info@simparts.nl. You can also click on the link at the left of this page under 'Special' 'Contact us'. Fill in your details and try to formulate your question explicit and we will respond to your question or comment as soon as possible.